As a designer-manufacturer of bespoke photo collage canvas prints, it's not only my belief but my passion, too, that a photo collage has the potential to be the most personal of all presents. Here are a few major events where such a gift would live long in the memory afterwards. The birthday celebration party can always gain from having one of these unwrapped among the guests. Its a gift that celebrates every cliche in style. Custom designed to your every need, these can span 40 years of photographs old and new (40 for this particular example). If you have old photos then take a photo of them using your phone, this works very well. During the day in a well lit room is the best time to do it. I will take care of making the photos look perfect once I receive them. This example has our unique feature of text along the sides. The font on the front was one of around 10 the customer got to choose from and Black & White was also an option the customer requested. You don't need to use this app by any means but its very neat. Place your photo on a flat surface in a well lit room . Making sure it snot reflecting any direct spot lights. Take your phone and make sure the camera is set to the highest possible quality / resolution. Take a photo and make sure you are at least 4 - 10 inches away so that it can focus, each phone will vary but you can tell by watching the screen. Take at least two photos of each picture. When you send me these photos I will crop out the photo so all background is gone. I can also correct angle/perspective if needed and correct the colour and lighting. Here's an example of a very different collage as requested by a customer recently which I loved the results of. Its a three piece photo collage canvas total size of 48x48 inches (with the gaps). The customer requested a circular shaped frame which we don't do, so we designed a circular collage on a square canvas split over three pieces. this was the alternative. We even took into account the spaces to make sure that once it's hung its a perfect square with a perfect circle. Total of 170 photos used. Designed from scratch, each collage is truly unique. We arrange the collage one photo at a time, taking in to consideration the content of the photo and the overall balance of the collage as a singular piece. The style of the arrangement is chosen by you and any special requests are welcome, in fact we encourage it. For example, customers commonly ask for a particular photo to be the centre piece of the collage. All this is discussed by email, after you make your purchase. 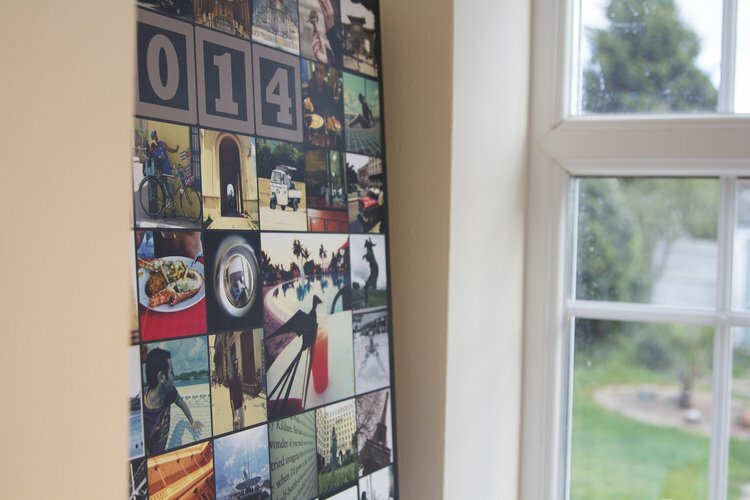 Finally we are proud to be the first to ever utilise the sides of the canvas frame to add a title to the collage. This is perfect for names, dates, places as well as quotes. Don't feel limited in any way, if you want us to add text on the front we are more than happy to do so. Sizes range from 16x16 to 20x40, landscape is the standard orientation but portrait is also an option. This is one of our most popular products and we strongly feel we have taken the concept and dramatically improved it. 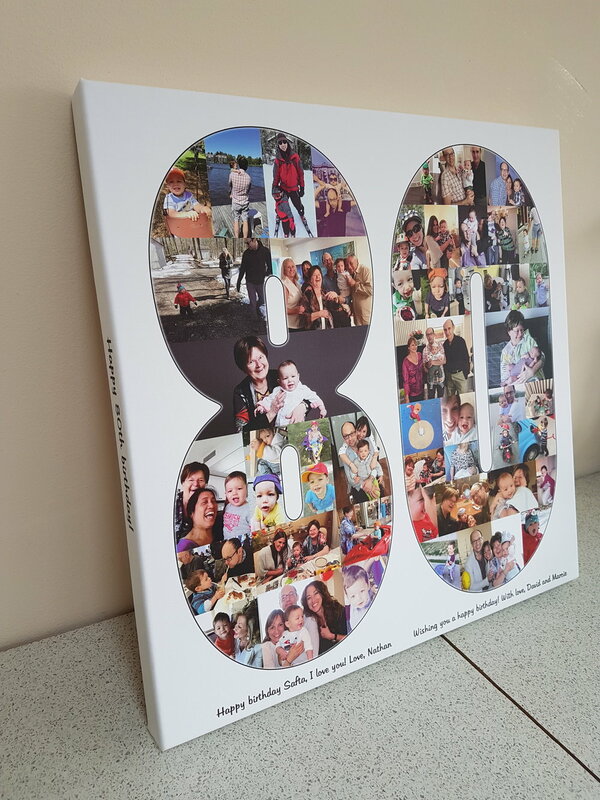 Like all our photo collage products, we don't use any automated software to do the final arrangement but individually place each photo where we feel it best fits the overall composition, taking into account how photos overlap so no faces are obstructed. Other stores are selling the heart shaped collages with 100 photos, these are simply too crowded and unrealistic. Through experience we have found the magic number to be 45 - 65 depending on the canvas size, this is perfect balance needed to make sure that each photo is large enough to be appreciated whilst still giving a great heart shape. We also print at very high resolutions allowing incredibly high detailed images to come out sharp and clear. The idea here is to celebrate the greatest day in most peoples lives which is always professionally photographed. These photos are far too good not to be printed on large premium canvas. What we also like to do though is allow you to personalise it with dates, names, quotes as well as wedding vows or a best man speech. We will show you a few different designs based on your requests and then once you're 100% happy we will print this onto lush award-winning archival certified canvas. 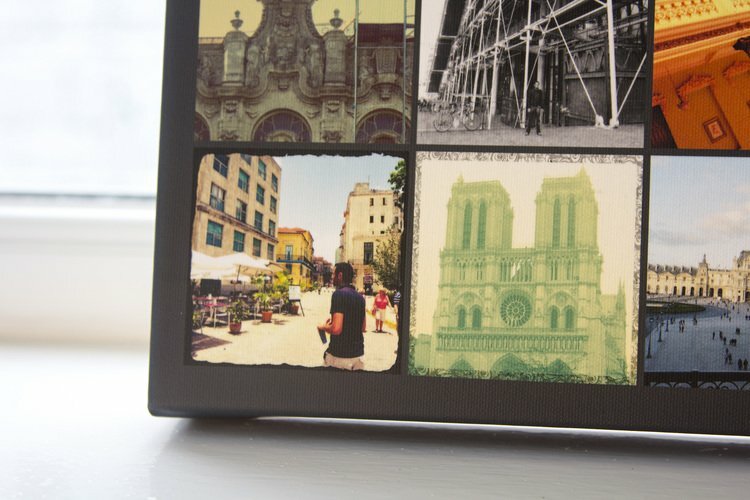 Our latest product is simply a grid arrangement of the square Instagram photos. We can also convert your standard photos into square photos with added filter effects to give it the classic Instagram look. 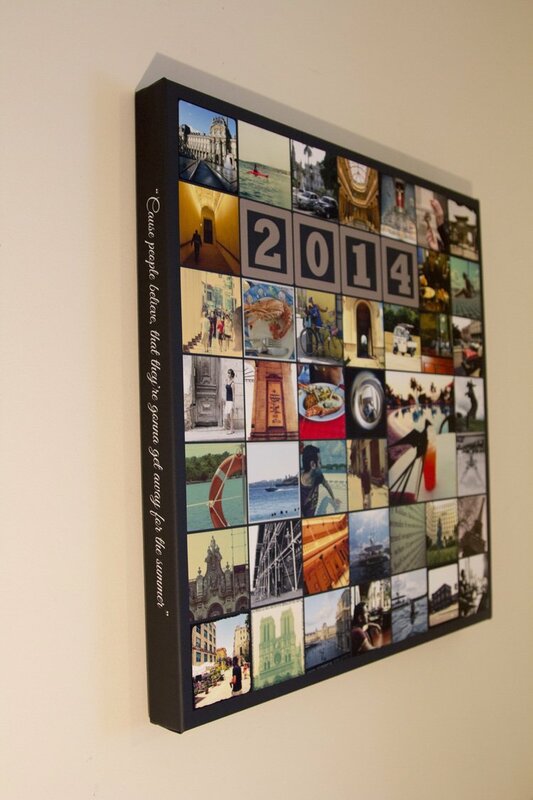 As with all our collages you can personalise the sides of the canvas frame with text. If you would like any photos to be made larger, they have to be double the size across and down, and you would simply need to send 3 less photos for ever one large photo. As an example, the 20x20 Inch Instagram collage requires 49 photos. To have one photo made large as a centerpiece, you simply need to send us 46 photos. These look amazing and as standard we are doing these on dark grey backgrounds which added a cool modern edge. You can also replace photos with letter blocks to spell out some text. Another unique idea originally created as a request for one of our first customers. This is basically two or three slim panoramic 8x24 Inch canvas collages with up to 14 photos on each. The 10x30 allows up to 20 photos on each. Having two or three collages allows you to show different aspects such as three generations of a family, or three different years at university. Otherwise just have three because it makes a very unique and great looking wall decoration. 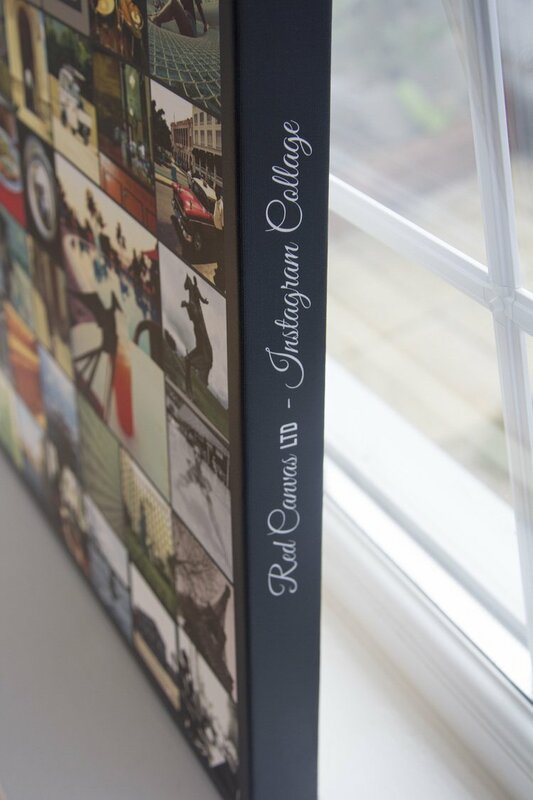 As part of any photo collage ordered here at Red Canvas LTD, we offer a fantastic free photo scanning and restoration service for up to 40 photos. Just post them to us (UK only). This is a perfect way to celebrate your old family photos that would otherwise just sit unappreciated in a photo album. Another great reason is because we are designing the collage for you and can arrange it in anyway you like. This allows you to potentially mix old photos, now scanned and restored digitally, with new digital photos. We can show a chronological history from birth to the present day or a mixed collage of grandparents to grandchildren. If you want a photo collage made from your old photos click here and choose your preferred style of collage. I recently did a photo collage for a customer requiring 11 photos to be scanned. I restored the photos, dating back to the 1950's and changed them all to black & white then balanced their tone and brightness so they all sit well together, as if they were all taken with the same camera getting the same amount of light. Finally I added a mild sepia tone to warm up the overall feel of the collage. As always we recommend customers add a text title to the side of the canvas to help tell the story. In this case the date, place and family name are added. I have always like and knew that this is going to be a popular product but it took me a while to get round to releasing it as a product on my store. After an Italian customer requested one I got to finally test it out and that got the ball rolling for me. As always I wanted to add something unique and the idea of replacing photos in the grid with block text was the first t idea I had. After all it's about customisation and personalisation. Added to that we have the option of making one or more photos larger by taking the spot of 2x2 photos. Its possible to go larger if you need. I have listed the item with the maximum photos as a guide but of course less is possible and sometimes less is more.